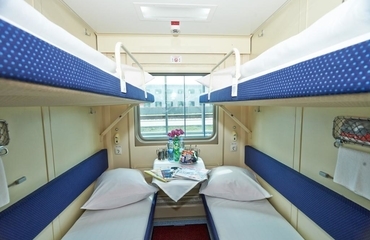 Often the train Grand Express is compared to a 5-star hotel on wheels. No other train can boast the same services available for every passenger regardless of a carriage class: free Wi-Fi internet, digital TV, hot breakfast. In the city of arrival the passengers of the luxury, premium and business class carriages can use the service of a personal transfer, which is included in the ticket price. A superior compartment. Buying 1 or 2 seats is possible. Seats: 2 lower sofas 70 cm wide Berths arrangement (number): horizontal (2) Included service: hot breakfast, tea/coffee, hygienic kit, slippers, comfort class transfer. Amenities: TV, socket, a/c, Wi-Fi, safe, wardrobe. Carriage: 9 compartments. A premium single compartment with a washbasin. The cabin is sold entirely for 1 person. Seats: Transforming sofa 100 cm wide, upper berth 80 cm wide (folding). Berths arrangement (number): vertical (2) Included service: hot breakfast, tea/coffee, hygienic kit, slippers, comfort class transfer. Amenities: TV, wash basin, a/c, Wi-Fi, safe. Carriage: 9 compartments. A superior compartment. Buying 1 or 2 seats is possible. Seats: 2 lower sofas 70 cm wide Berths arrangement (number): horizontal (2) Included service: hot breakfast, tea/coffee, hygienic kit, slippers. Amenities: TV, socket, a/c, Wi-Fi, safe, wardrobe. Carriage: 9 compartments. A premium compartment with a washbasin. Seats: Transforming sofa 100 cm wide, upper berth 80 cm wide (folding). Berths arrangement (number): vertical (2) Included service: hot breakfast, tea/coffee, hygienic kit, slippers, business class transfer. Amenities: TV, wash basin, a/c, Wi-Fi, safe. Carriage: 9 compartments. Luxury carriages (which are called “soft”) have fewer compartments (4-6) and the cabins are larger than in the ordinary first class carriages. There is shower in the carriage or even in the compartment. Most compartments include a private bathroom. Other amenities include TV and individual a/c. The cabins in luxury carriages are sold entirely for one or two passengers, it guarantees the most level of privacy and comfort. A large compartment with a private bathroom. The cabin is sold entirely. Seats: Transforming sofa 110 cm wide, upper berth 80 cm wide (folding). Berths arrangement / number: vertical / 2. Included service: hot breakfast, fruits, fresh juice, tea/coffee, travel set, cosmetic kit, bath robes, slippers, business class transfer. Amenities: TV, DVD, shower, WC, a/c, socket, Wi-Fi, safe. Carriage: 5 large compartments. A spacious compartment with a private bathroom. The cabin is sold entirely. Seats: Transforming sofa 110 cm wide, upper berth 80 cm wide (folding). Berths arrangement / number: vertical / 2 Included service: hot breakfast, fruits, fresh juice, tea/coffee, travel set, cosmetic kit, bath robes, slippers, business class transfer. Amenities: TV, DVD, shower, WC, a/c, socket, Wi-Fi, safe. Carriage: 6 spacious compartments. A large compartment with a private bathroom and luxury service. The cabin is sold entirely. Seats: Transforming sofa 110 cm wide, upper berth 80 cm wide (folding). Berths arrangement / number: vertical / 2. Included service: hot breakfast and supper, fruits, fresh juice, tea/coffee, hygienic kit, bath robe, slippers, business class transfer. Amenities: TV, DVD, shower, WC, a/c, socket, Wi-Fi, safe. Carriage: 5 large compartments. A spacious single compartment with a private bathroom. The cabin is sold entirely for a single passenger. Seats: Transforming sofa 110 cm wide. Berths arrangement (number): vertical (1) Included service: hot breakfast, fruits, fresh juice, tea/coffee, hygienic kit, bath robe, slippers. Amenities: TV, DVD, shower, WC, a/c, socket, Wi-Fi. Carriage: 6 spacious compartments. A standard compartment. 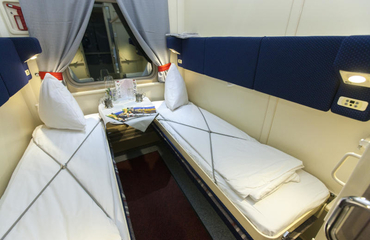 Seats: 2 lower and 2 upper berths 70 cm wide Berths arrangement (number): 2+2 Included service: hot breakfast, tea/coffee, hygienic kit, slippers. Amenities: TV, socket, a/c, Wi-Fi. Carriage: 9 compartments. A standard compartment. Seats: 2 lower and 2 upper berths 70 cm wide Berths arrangement (number): 2+2; Amenities: TV, socket, a/c, Wi-Fi. Carriage: 9 compartments. 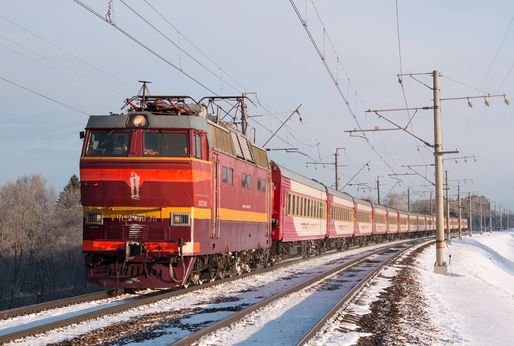 Grand Express is the most luxury overnight train operating between Moscow and St. Petersburg. This comfortable train consists of 4 luxury cars, 4 first-class cars and 2 second-class cars, as well as a Staff car and a Restaurant car. There are different classes of cars and each of them offers a certain range of services. However, there are such amenities that are available for each passenger of Grand Express train: free Wi-Fi internet and digital TV, as well as hot breakfast. No other train can boast the same services available for every passenger regardless of a carriage class.